HILLARY CLINTON AND BARACK OBAMA MAY AS WELL BE IN BED WITH THE RADICAL ISLAMIC TERRORISTS! They won’t use the words “Radical Islamic Terrorism”! They insist on bringing thousands of Muslim immigrants from dangerous parts of the world into our country–If elected president, Hillary has stated that she is going to increase what they have done in recent years by 550%! It would be fantastic to see her rejected just like the prime minister of Germany, Angela Merkel, who flooded her country with at least a million or more Muslim refugees from Syria, many of whom have raped, murdered, and spread their troubling ways, including many other varied crimes! They have caused many problems all over Germany!—Merkel was recently voted out of office!! Thank God!! Obama And Clinton Have Both Highly Praised and Supported Merkel As She Tried Her Best To Screw Up Her Own Country!! In our country, we keep on having murders, bombings, stabbings, knifings, shootings, rapes, and all kinds of crimes that are Radical Islamic Terror! 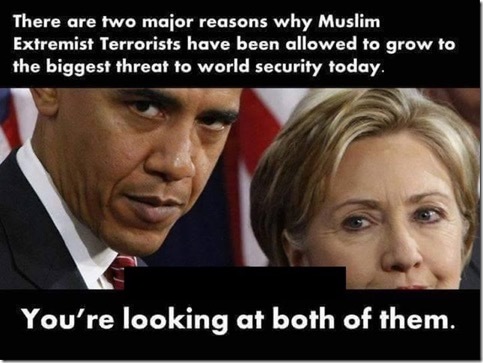 Hillary and Barack continue to be blind in one eye and can’t see out of the other, they both are apologists for, excuse makers for, and supporters of Islamist’s and the Muslim Brotherhood and other Muslim organizations Nation-wide and World-wide! To Hell With Keeping America Safe! They are supporting and causing a Muslim invasion of our America and other countries in the West! Our Government and Whitehouse are very much occupied by many Muslims! Heck, many of Obamas’ & Clintons’ closest and dearest advisors are Muslims! Clinton & Obama are the reason for ISIS because of their foreign policies and many poor and evil choices that they have made and perpetuated! They caused the deaths of 4 American’s in Benghazi, Libya and are still perpetuating a cover-up! They have caused the deaths of many American soldiers and many people and other soldiers world-wide! Clinton & Obama Are Giving And Furnishing More Aid & Comfort To Our Enemies!! They both, are very dangerous! Obama is almost out of office, and our country and world don’t need any more of the same or worse from Clinton! !